For the second day of Sindhi dishes, I decided I had to make something with cluster beans, the sindhi way. As I had said my wish of putting my cookbooks to good usage went down the drain, I had to think of ways to make the best of what I had. Though the perennial question “What to make for dinner” seems to plaque every household, somehow it is not so strong when I can discuss that with Athamma. Now hubby dear said he is dreading the moment I step in, as I ask him that right away! I also warned him that he has to play critic to the BM theme this month as I was planning on making regional specific. Which means he has no say in quoting the authenticity other than simply saying if it was good or not. With the lack of time, I almost decided I should split the dal and aloo tuk to separate days, I knew it looked so simple to post separately. Luckily I have landed with enough dishes to do it together. However this gravy I did with cluster beans had to be a post on it’s own. In fact when I googled for sindhi style Guaar dish, I couldn’t find much. I had to settle down to one source and requested Vaishali to seal her approval. I couldn’t do that as well. So in the end I have to share and hope this is sindhi. We normally make cluster beans in two ways. One dry saute with spices and roasted peanut, another gravy as a side dish for either dosas or chapatis. This version ended up being a dry saute with more of spice than what we normally add. It went fine with chapatis. Wash the chopped guaar 2-3 times in normal water. MW the beans in enough water for 10 mins, drain the beans and keep it aside. In a non stick pan, heat oil, Add cumin and mustard seeds and allow to crackle. Add green chillies and ginger-garlic paste, cook for 2 minutes on low flame. Add chopped tomatoes, salt, red chilli powder, turmeric powder and mix well. Cook for 3-4 minutes until nice color of tomatoes appear. Add boiled beans and coriander powder, saute for 2 minutes. Add 1/2 cup of water and garam masala powder, mix thoroughly. Simmer with lid covered so that the masalas are cooked and coats the vegetable. Finally add the dry mango powder, combine everything, make sure the subji is dry. Sindhi Guaar is a dry Subzi, so cook till all the water is evaporated. I was skeptical about adding both cumin seeds and mustard for tempering. By default other than our andhra dal, I never add this combination for gravies. Come to think of it, other than dry mango powder, everything else is the same as how we make our kuras (gravies). So that goes to say that simple dishes across states are very much similar in their making. 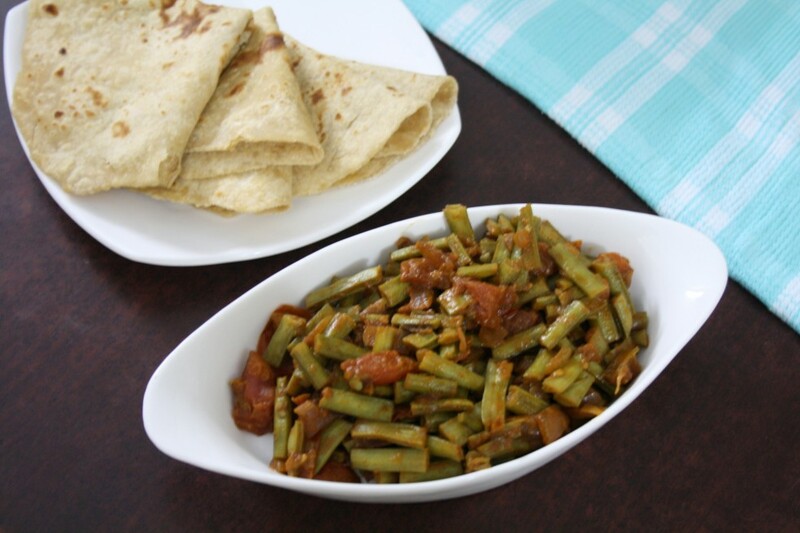 This dry cluster beans goes awesome with rotis na, cant wait to make some this way. Valli the cluster beans are almost Sindhi…musturd and cumin both are not used in tempering..but you have perfect spices and the dish looks inviting. This is so different from what I make. Love it. Like you said goruchikkudukayalu are usually made in just 1 or 2 ways — this curry sounds delicious. I love cluster beans ! It's new way for me to cook without potatoes..
Wow! that is another variety to make with cluster beans! that is so simple and so comforting… love to have these with roti… thanks for the recipe valli!!! I second PJ. Even am not a fan of cluster beans. But with the spices mentioned and the flavour. this can make way to our home. 🙂 Neat presentation Valli.